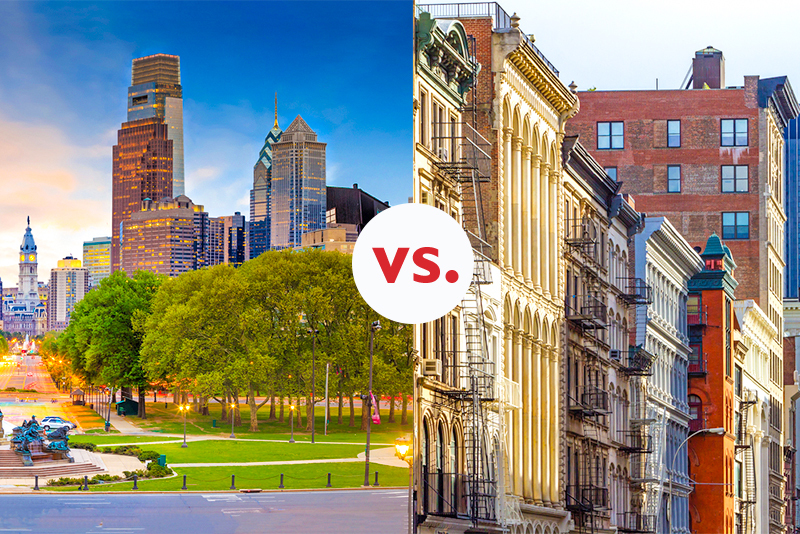 Which Jersey Metro Area Is Better for Retirement: New York City or Philadelphia? New Jersey may not have a big city within its boundaries, but it does have suburbs that service New York City and Philadelphia. So, which one's better for you? Living outside of a big city has its benefits, and Philadelphia and New York City are two of the biggest and best on the East Coast. They offer top-tier medical care, museums, restaurants, concerts, festivals, and activities that you just can’t find in smaller hamlets. This is why many active adult communities have sprouted up near large cities, giving their homeowners better access to these offerings. The City of Brotherly Love and The Big Apple are quite different from one another, though. For starters, Philly has a population of around 1.5 million, while New York City is well over 8 million. Bigger can be better when it comes to things like medical care, leisure opportunities, more jobs, more people to meet, and nightlife. Yet with all this comes more congestion on the streets, traffic, and a higher cost of living. Personal preferences dictate home buying decisions, it's all about give and take, and homebuyers’ distinctive personalities. Here's what to know about living in New Jersey's Philadelphia suburbs. Steeped in history, Philly is a haven for Revolutionary War buffs. Its city center is dotted with landmarks like Independence Hall and the Liberty Bell. 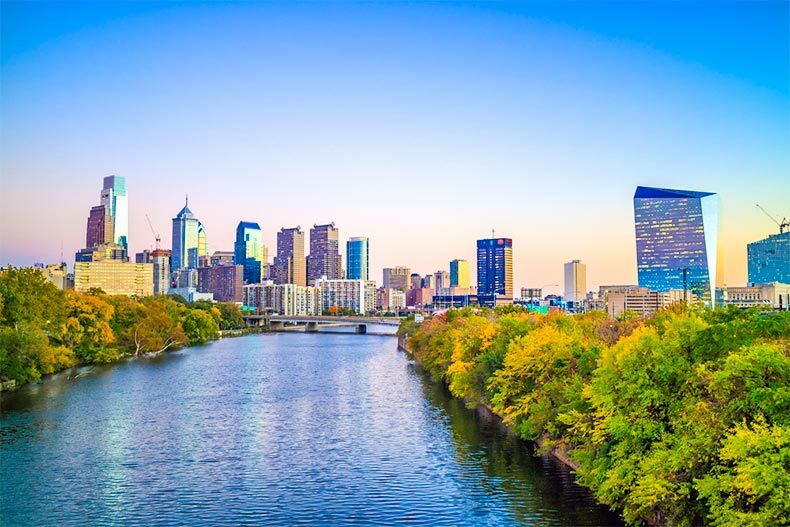 For arts and culture, visitors head to the Kimmel Center for Performing Arts, The Franklin Institute, and the Barnes Foundation, to name a few. Culinary adventures abound at top restaurants like Zahav and Vernick Food and Drink, and upscale shopping experiences can be found at Rittenhouse Square and The Shops at Liberty Place. And when medical care is needed, it is reassuring to know that there are top hospitals like Thomas Jefferson University Hospital and University of Pennsylvania Hospital in the city. Like other large cities, getting in and out of Philly can be complicated at times. There are four bridges that cross the Delaware River over from New Jersey into Philadelphia: Ben Franklin, Betsy Ross, Commodore Barry, and Walt Whitman. Tolls are generally $5, and EZ Pass is available. PATCO offers high-speed transit trains from Camden County, NJ into Philadelphia, and NJ Transit offers transportation into 30th Street Station. The three New Jersey counties closest to Philly are Burlington, Camden, and Gloucester, with a total of 45 active adult communities. One of the closest is The Plaza Grande at Garden State Park, in Cherry Hill. A newer condo community, it is less than 10 miles from Center City, Philadelphia. Holiday Village East in Mount Laurel is 15 miles away, and Northgate at Heritage in Deptford is also close. Homes at Northgate run in the $200s, and the other two are comparable. Local taxes are important to consider when purchasing a home. Taxes are calculated depending on where you live, and vary by county. In Camden County, the general tax rates vary from just under 2 percent up to almost 6 percent. Burlington County can be lower, from 1.7 to 4.4 percent. Gloucester County rates range from 2.5 to 4.6 percent. 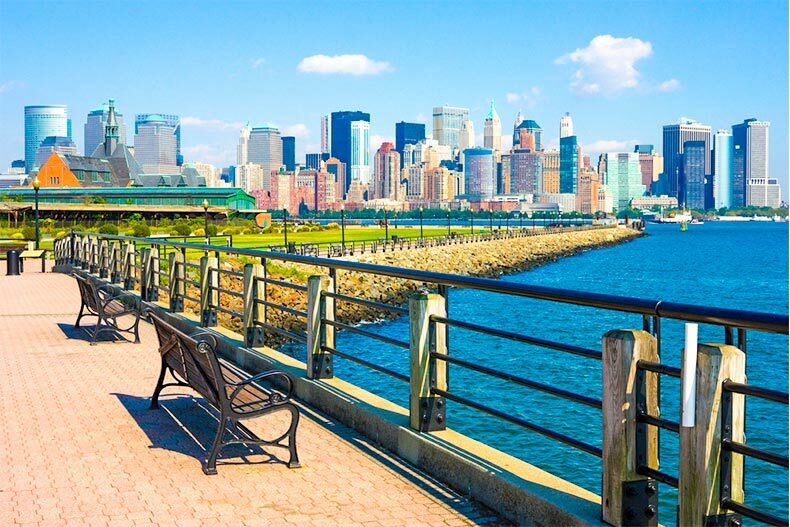 New York City is just across the river from New Jersey, but there are plenty of other suburbs with easy access to the city. The “City That Never Sleeps” is a vibrant metropolis, with restaurants, museums, and just about anything else you can think of on most streets. Each of the five boroughs (Brooklyn, Manhattan, Queens, Staten Island, The Bronx) offers its own unique excitement. Whether you like seeing world-renowned shows on Broadway, schmoozing with celebrities at hot spots like the Rainbow Room, or jogging in Central Park, New York is teeming with interesting and rewarding things to do. Some of the best hospitals in the country are here, like New York Presbyterian/Columbia Medical Center and Mount Sinai. Of course, there is that traffic to deal with. There are four bridges and two tunnels connecting New York and New Jsrsey, with tolls averaging around $12.00. Public transportation is key, and there are seemingly endless options in to, out of, and within the boroughs. MTA operates buses, subways and trains in the city. PATH trains connect Manhattan to Hoboken, Jersey City and Newark. NJ Transit also offers commuter options, as does the Staten Island Ferry and the Long Island Railroad. The closest Jersey counties to New York City are in North and Central Jersey: Bergen, Essex, Hudson, Middlesex, and Union. Housing choices in North Jersey are more limited the closer you get to NYC, and costs may be higher. Paris Square in Northvale is about an hour away, with homes priced from the mid $400s to the mid $600s. Spinnaker Pointe in Parlin has lower price points and is also about an hour away. Shoregate in South Amboy is closer and more affordable, but it may be harder to find a home for sale here. Local tax rates in Bergen County are not as high as one might think: In Saddle River, it is around 1 percent; one of the highest is Bogota, at 3.8. Some Middlesex towns are much higher, starting at just under 2 percent and going up to almost 13 percent in Dunellen. Will I not settle for less than the best in entertainment, shopping, and bagels? Can I deal with hours spent sitting in my car, in traffic, on a bridge or in a tunnel? Do I want to get more house for my money? There are many more questions, but you probably get the drift. Do the research, and check out the active adult communities near both cities with homes for sale in New Jersey. You will soon be on your way to making an educated decision about which area is best for you.